Freedom Massage is a five-time award-winning establishment for BEST massage. We are owned and operated by a massage therapist who has been practicing massage for over 20 years. She understands client needs AND therapist needs. We cater to massage enthusiasts who understand the difference between an average massage and an excellent massage. We also welcome newcomers to massage and believe your first experience with us will keep you coming back. We welcome you to come enjoy the warm and peaceful environment found exclusively at Freedom Massage. We are a professional family and we can not wait to work with YOU! Diane has been practicing massage for more than 20 years. Although she is the owner, she is still an active participant in providing bodywork to our clients. Watch a video of Diane explaining why Freedom Massage has become an award winning business. Freedom Massage has grown primarily from happy clients spreading the word throughout Chester County. Diane is a NCBTMB approved continuing education provider. In 2006, she published her first book, The Body Is Art: A Mentoring Guide for Massage and Bodywork. Diane has also written articles and been featured in MTJ magazine, Massage magazine, Massage and Bodywork, Massage World, Different Strokes, Main Line Today and the Daily Local News. She has been a blogger for EmmeNation, an online forum and trusted resource for women. In 2010 she was the Official Massage Practitioner for the women’s professional soccer team, the Philadelphia Independence. She has also been an active participant in childbirths as a coach and massage therapist helping women give birth naturally. She recently finished her second book, The Massage Therapist’s Guidebook, which as been approved by the NCBTMB as a home study course toward CEU’s. Learn more about The Massage Therapist’s Guidebook. She works closely with leaders in the addiction recovery field and has provided massage and workshops as therapy. Diane works with couples at Breakthrough Healing through Connection Weekend at Caron and provides a new angle on how couples can communicate. Currently, Diane is not taking on new clients. She is grateful to have been seeing most of her clients since the 90’s and is only available for new client’s on Tuesdays at a higher rate (additional $40/hr). Alicia is a NCBTMB continuing education provider with Freedom Maassage. She became Nationally Certified in Therapeutic Massage and Bodywork in 2011 and is a member of ABMP. In pursuit of a more advanced knowledge of corrective modalities, Alicia completed Cross Fiber Techniques, and she also completed Yin Myofascial Integration Immersion, both through Integrated Natural Health. She is an avid reader and is continually exploring models of wellness and balance across cultures, disciplines and therapeutic practices in order to bring deeper insight into each session. Alicia loves massage and connects deeply with her clients. She will go deep without extremely deep pressure. Alicia provides Swedish relaxation, Deep tissue, the Freedom massage, Pregnancy sessions, and uses techniques from the classes listed above. Alicia is passionate about helping clients both work through “issues” with which they present each session as well as achieve an even better connection to their bodies and experiences. After a bit of a search she has happily landed at Freedom Massage and likes how it has “the best of” everything she loves about massage. Alicia truly exudes love for her work. She is brilliant and we are honored to have her here at Freedom Massage. She is basically an anatomy book, she is very intuitive, and she is our first teacher under our owner Diane! She already wrote an ethics class with Diane. She is busy, so if you want to work with her book out your appointments! Her hours are Monday 9:30-2:30, Wednesday 9:30-2:30, Thursday 9:30-2:30, Friday 9:30-2:30, and every other Saturday 10-4pm. How has massage changed/influence your life? I cannot think of a facet of my that life has NOT been influenced or changed by massage! My personal physical health and wellbeing continue to improve over my years of practicing; I have become far less stressed and more mellow and flexible as an individual. Through my practice, I have become a better communicator (both listening and speaking) with others and continue to see growth here all the time. Most significantly and for what I am most grateful, massage helps me appreciate ALL INDIVIDUALS. Intangibly, massage has brought me to a better understanding of myself, my past experiences, and my priorities; and it has shifted my thinking process from finding answers, knowing, and fixing toward a mindset of making connections and correlations. What style of massage to you prefer giving and receiving? My favorite styles of massage to give are Myofascial and corrective work. Myofascial techniques, both subtle and deep, are my favorite to receive. When intention is shifted from working a specific tissue/muscle/structure to working within the SYSTEM of connection encompassing all tissue, I find more significant release occurs and often the release(s) lasts longer. What do you do for personal self-care? Over the years, I have incorporated many practices into my daily routine and have made lifestyle changes as well to better care for myself and be able to enjoy my life to its fullest. Some practices I follow daily, others as often as possible. Why did you choose Freedom? IT FEELS SO GOOD INSIDE THE WALLS! What makes Freedom Massage different? 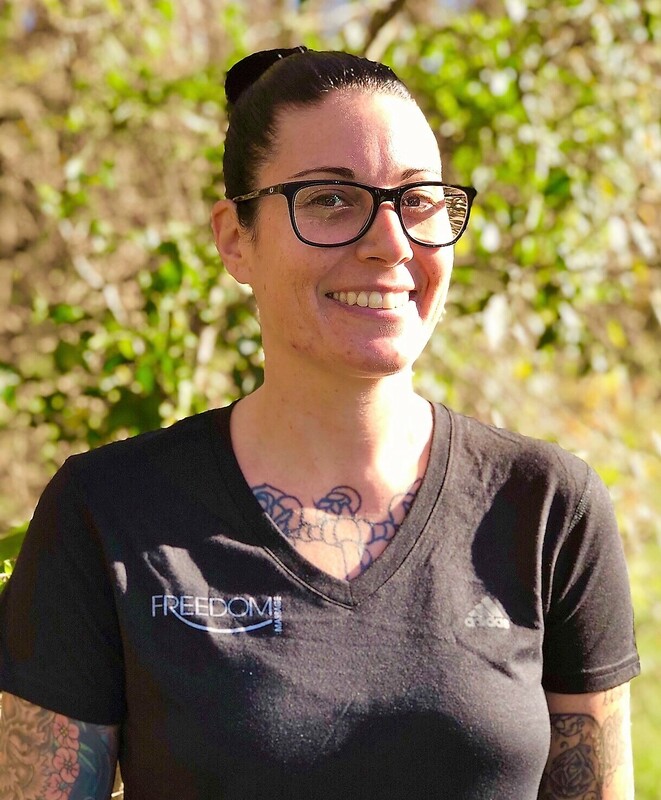 Freedom Massage has been built by an owner who is a massage therapist; she understands the “job” and the many balances involved in creating an EXPERIENCE for clients each and every session. This business is CLIENT-FOCUSED and the therapists are HAPPY and well-cared-for. The staff here all work with the highest degree of professionalism and integrity I have ever experienced throughout my entire employment history, including work outside of this profession. ALL of the reasons that I choose to work here, which I listed in the previous question, are also parts of what makes Freedom Massage different. Athina graduated from Cortiva Institute with 4 times on the honor roll and is a member of ABMP. She received a bachelor’s degree in general nursing from her country Albania in 2014. That is right, Athina comes to us all the way from Albania. She is the therapist in the back office always watching massage videos. She is constantly exploring new techniques to help her clients. If you see her a few times you will notice you may received a noticeably different session each visit. We are amazed by her courage and dedication to pursing massage. Having a medical background has helped her understand pathologies on a deeper level. She cares deeply about her work. Her forearm work is excellent so request it. Athina is also know to do great neck work. She may be quiet at first, though she has an awesome sense of humor. When Athina arrives to work we know there will be laughing upon her arrival. Athina is not new to massage and came to us from another company. We are thrilled to have her with us. We are honored to have her on our team. Her schedule fills quickly, so book out once you get on it! We have a lot of clients enjoying the variety of sessions they receive. Her hours are Monday 3-8:30, Tuesday 3-8:30, Thursday 3-8:30, and Fridays 3:00-8:30pm, and every other Saturday 10-4:30. How has massage changed/influenced your life? I have always wanted to do massage. Massage has changed my life completely. My career in massage has made me more aware of my body, mind, spirit, eating healthy, and the value of exercise. Massage for me is an art and massage therapists are artist. What styles of massage do you prefer giving and receiving? I will always explore different techniques because learning is one of my passions. I like to do focused work and all enjoy all styles we provide at Freedom Massage. For myself, I will always change depending on my needs. What do you do for personal care? Massage is my favorite self-care. I enjoy reading books, stretching, Epsom salt baths, time with my husband and family, music, and movies. Why did you choose Freedom Massage? 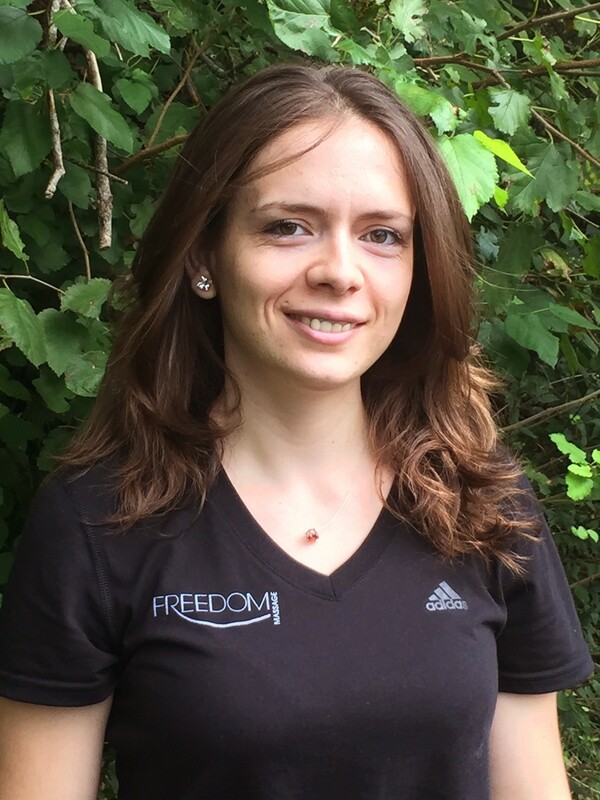 I chose Freedom Massage because I wanted to be a part of a team that will help me grow as a professional and an individual. I wanted to work at a place where my needs as a massage therapist were appreciated/evaluated and Freedom Massage provides that comfort. I also like the time and consideration that Freedom Massage put into overall client care and making sure client receive therapist’s full attention. Having an owner that has been massaging for over 20 years, it makes this business different than other massage businesses. Freedom Massage is only dedicated to massage and no other services. I believe it shows that we are focused on providing an excellent massage experience. We chose one area of expertise to share with the community. Emily’s our Oncology Massage Specialist (Certification course approved by Society for Oncology Massage S4OM.org). She works closely with Unite for Her, an organization helping women with breast cancer. A graduate of Cortiva Institute, Emily is certified in Trigger Point Therapy. Emily has completed Levels I & II Usui Reiki and finished the Advanced Usui teaching as well. She provides Oncology massage, Swedish relaxation massage, Deep tissue massage, the Freedom massage, and will integrate Reiki into sessions (if requested). Emily’s soothing massage and slower pace will leave you feeling relaxed and renewed, all while still getting relief from tight muscles. Clients who see her keep coming back, so be sure to book out several appointments when you come for your first visit! Emily loves what she does and you will see the excitement she exudes when you arrive. Emily grows and grows as a great human being and massage therapist. She will with out a doubt put you at ease, then in a state of deep relief. Here work is meticulous and awesome. We are honored to have her with us. If you get on her schedule book out, because it may be a long wait until she is free again. Her hours are Tuesday 2:30-8:30, Wednesday 3-8:30, Friday 3-8:30, and usually every other Saturday 10:30-4:30. Massage has changed my life on many levels. A big example is that it has shown me you don’t have to fight with your body. Aches and pains are our body’s way of telling us something needs our attention. Getting regular massage has helped me learn to tune into my body’s cues and what it is needing. It’s easier to love and be friends with your body than to focus on the negatives. What style of massage do you prefer giving and receiving? I prefer to get and give a massage that is tailored to where the body is at at that moment. As a massage therapist I like to take the time to check in with each client and see where they are in life at that moment. Some days you may need a good deep tissue session while others you may need to relax more than anything else. Everybody and every body are dealing with different stresses each day. For personal self-care I do Yoga, exercise, spend time outside, and spend time with animals. I had heard about Freedom while I was in school for massage. I liked the it idea of working for a small business. I also liked how the massage therapists at Freedom were encouraged to keep learning and pursuing their interests. Freedom seemed like a place where I would learn and grow a lot, and I have! Freedom Massage isn’t just about getting people in and out the door. We genuinely care and do want you to feel better after your massage. This is shown with all the care that is put into your full experience at Freedom Massage. From when you first walk in, to receiving your massage from a well-trained therapist, to when you leave (complementary snack & water in hand) and get to spend a few peaceful minutes looking at nature(we are in a peaceful wooded business Park). Jenn is a LMT who graduated from the Cortiva Institute, and is a member of AMTA. She is our newest team member, though it is difficult to believe once you receive her work. Jenn worked in PT/OT gym at Bryn Mawr Rehab right out of high school. She became interested in massage therapy while helping clients at the rehabilitation center. She then received a certificate to become a Medical Assistant, though she couldn’t get massage out of her mind. Jenn knew massage was her calling so she attended the Cortiva institute. Jenn finished as one of the top in her class and also received a Clinic Shining Star award given to her at graduation. 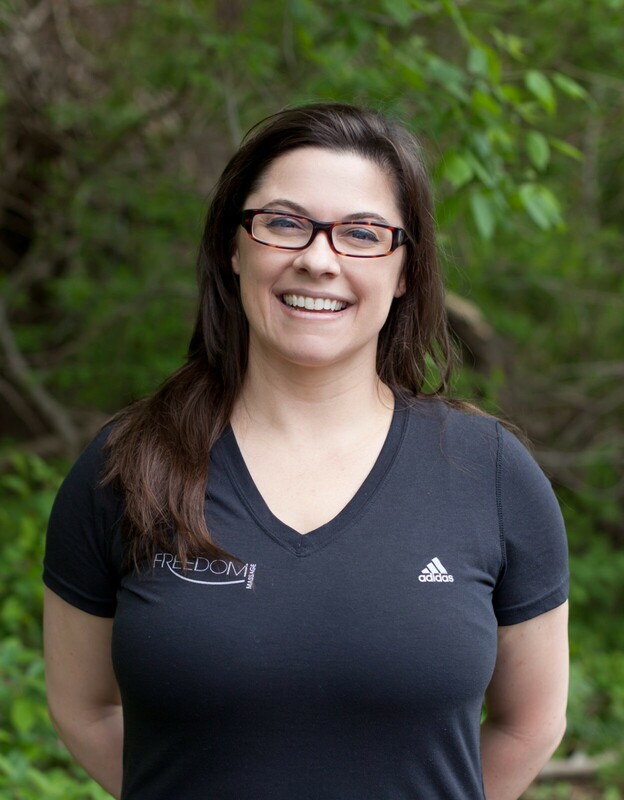 Jenn’s touch is solid and the team here at Freedom Massage agrees massage is her calling. She is easy going, hard working, and has a huge heart. She came to us and jumped all in. We are happy she joined us. Book as far out as you can, because her appointments will not last. Her hours Tuesday 3-8:30, Wednesday 3-8:30, Thursday 3- 8:30, Friday 3-8:30, and every Saturday 10-4:30. Massage has changed my life completely because I knew it was my calling. It has always been a dream job of mine and now I finally get to fulfill it. I’ve always loved to help people and work in the medical field so this was right up my alley. It’s has helped me with my anxiety and has also opened up a whole new discovery with my mind and body. I will always be open to learn and grow with all the therapists and experience and explore new techniques but I prefer to give and receive deep tissue work. It has been an interest of mine ever since we have learned it in school and I’m continuing to learn more and get better with my techniques as I go on. I love to box, meditate, do Tai Chi, practice and study Buddhism, clean eat and take daily supplements. I love to cook so I’m always working with fresh ingredients like fruits, vegetables, meats and fish. I also love to lift weights and workout with Kettlebells. I’ve always heard great things about Freedom and went I went online to look at the website I got to read about all of the therapists and Diane and I knew that I wanted to be here under the supervision of all these amazing talented women. From the minute you walk in you get the sense of peace and tranquility. All of our clients have our full attention and are #1 in all of our therapists books. We work with everyone one on one to make sure that they are treated not only as a client but they are apart of our family here at Freedom. Everyone’s health and well being is very important to us. Diane is also a big part of going out and getting to know our community along with our surrounding areas. We aren’t your typical day spa we are one of a kind. Jennifer is a graduate of Cortiva Institute and a member in good standing with the American Massage Therapy Association (AMTA). 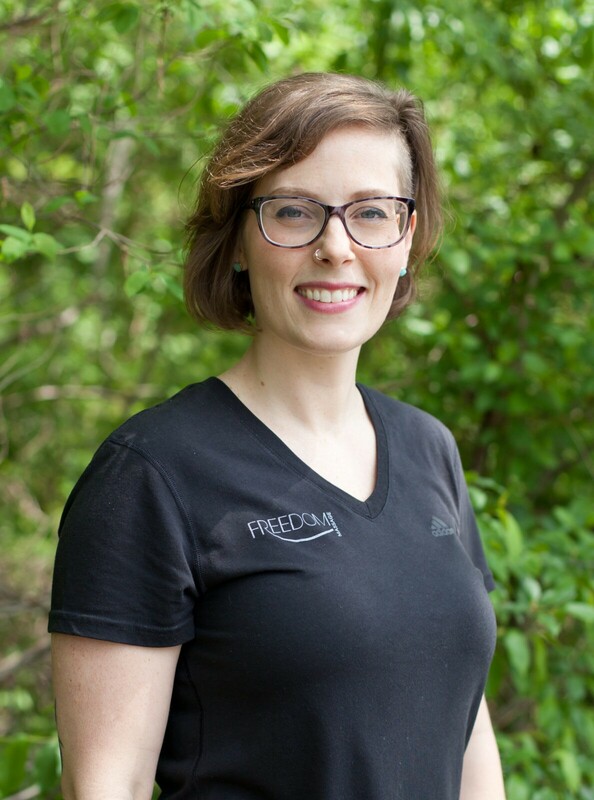 One of the things that drew her to a career in massage therapy, and eventually here to Freedom Massage, is her desire to help others feel their absolute best. Her classmates voted her foot massage as Best in Class, and one teacher stated that “she was clearly born to massage.” She performs Swedish relaxation massage, Deep tissue massage, Oncology Massage, and the Freedom Massage. Her cheerful, compassionate nature and intuitive sense of touch will have you completely relaxed and ready for an amazing session in no time! Her hands are very intuitive and non-invasive. If you want to feel her strength she has it, just ask, her work can also be strong and solid. We are honored to have her on our team. Schedule an appointment with her now, as her book fills up quickly and stays full. Her hours are Monday 2:30-8:30, Tuesday 10-2pm, Wednesday 3-8:30, Thursday 9:30-2:30pm, Friday 3-8:30, and every other Saturday 10-4:30pm. I got into massage due to a suggestion from a friend who told me I was naturally good at it, and I decided to check it out on a whim. The passion I discovered in the massage/bodywork community for caring for others and helping people along on their own journeys of self-discovery through bodywork is something that struck a deep chord in me, and I finally feel like I found what I’m supposed to do. I get to help people feel better in the course of just an hour— I think that’s a pretty great job description! As for how massage has changed/influenced my BODY, I used to get terrible, incapacitating tension headaches. I tried everything: Tylenol, ibuprofen, Excedrin, you name it— but nothing helped. Massage is the best and sometimes still the only way I can find relief! Regular massage keeps me pain-free and able to get on with my day! Massage has also helped me with correcting my posture and with managing my weight – getting the body back into homeostasis (the body’s state of balance or equilibrium) is a great way to increase metabolism, and giving massage can be a pretty good workout as well! Another life change I’m really proud of is that I used to struggle bitterly with anxiety and depression, and at least for me, personally, adding massage to my life has allowed me to (safely, with consent and guidance from my health care team) discontinue use of my anxiety/depression medications! I personally love to both receive and give the Freedom Massage style of bodywork. I find that incorporating a blending of styles is often the best way to attack the different muscular problems the body presents, and if I can get or provide relief without discomfort, that’s the way to go! Typical techniques I’ll use in a session range from myofacial release and light effleurage to cross fiber work and deep holds. I also love to incorporate stretching into a session, because sometimes what you can’t get to release by pressing INTO a muscle group, you get to release by pulling on it instead! Getting into the world of massage therapy and bodywork has really helped me draw attention to just how little thought or care I previously gave my body! Consistent self-care is still something I struggle with, and I’m working on adding more elements to my self-care routine. I do my best to get a massage at least once a month, and in an ideal world I would make that once a week! I dedicate at least ten minutes every day to doing something nice for my body, whether that’s stretching, self-massage, skin care or beauty rituals, etc. I’m a huge fan of Epsom salt soaks, or just a nice relaxing bath. I try to practice mindfulness throughout my day, focusing my thoughts on the present moment, and appreciating everything that happens as it comes. I check in often with my body and my emotions, and make adjustments as needed. On days when I’m not feeling my best, I take the time to be a little nicer to myself than usual, maybe curl up with a good book and a piece of dark chocolate. Getting enough sleep is very important to me as well, and every night before I fall asleep, I do a visualization meditation, involving picturing each muscle from my toes upward slowly filling with warm, soft, relaxing light. I tense and relax each muscle as it fills with light and slowly work my way upward…I’m usually asleep before the halfway mark! I chose Freedom originally just because I learned how short my commute is, but from the minute I first walked in the door, I knew this was the place I wanted to work for the rest of my career! The atmosphere is absolutely fabulous, so soothing and nurturing. Diane has invested a lot of time, energy, and money into making sure that every part of a client’s experience here at Freedom is top-notch. We have the most luxurious tables, every kind of support pillow or bolster we could possibly need to keep both the client extremely comfortable and also make it easier for the therapist to do our work safely and comfortably. The rooms are gorgeous, and impeccably clean at all times. I work with the best group of ladies I’ve ever had the pleasure to meet, and I have the best boss in the world! I have never felt more appreciated and valued as an employee and as an individual as I do here at Freedom. Diane pushes us all to extend ourselves daily, both on our own and as a group, and I really respect and look up to her a lot. We are offered extensive and continuous training, and I can see myself not only growing as a person and a professional here at Freedom, but flourishing as well. What makes us different I think is the level of care clients receive here. Clients are not just a paycheck here, every therapist on our staff genuinely cares about making a difference in our clients’ lives, helping people on their journey to wellness. There is a sort of positive energy here that I have never felt in any other workplace, and I think that translates over to our clients. Everyone here is so friendly and so skilled and so knowledgeable, and we have Diane’s wealth of 20+ years’ experiences in the field to back us all up. When I walk in the door here, every day, I think to myself, “This is the place to be.” It’s a sentiment I’ve heard echoed back to me from clients, and it’s definitely where I hope to stay for many more years to come! Jessica is a LMT who graduated from the Cortiva Institute, and is a member of AMTA. She received a certification in Vedic Thai Yoga Massage taught by Michael Buck an ambassador of the technique Thai Yoga bodywork. Jessica is a well- rounded therapist with a firm, intuitive touch. She believes in the importance of movement and stretching for overall health and well-being. Upon request, she will blend all the best aspects of Swedish/Deep tissue , and will add subtle hints of the Thai Yoga bodywork. Jessica provides Swedish relaxation, Deep tissue, the Freedom massage, Thai on the Table, and Pregnancy sessions. 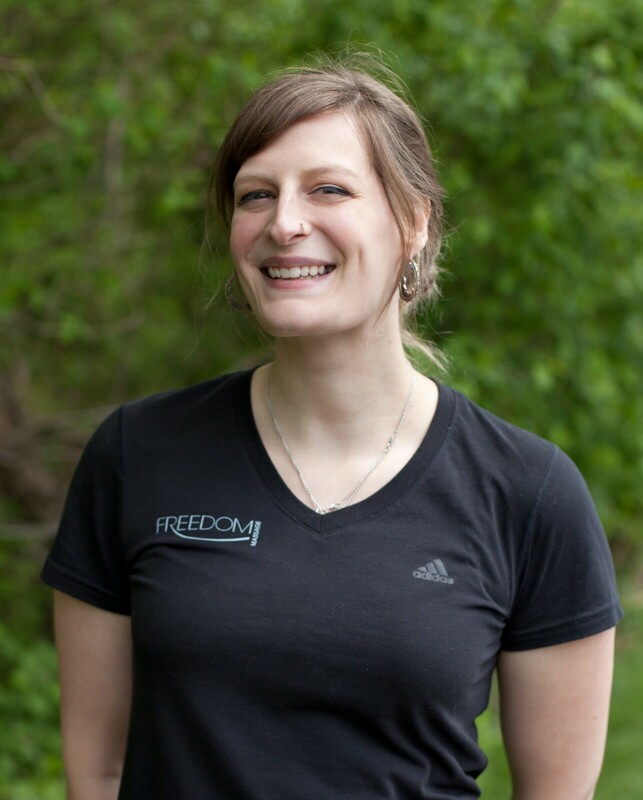 Jessica knew she wanted to join Freedom Massage after hearing the owner speak to her class and has found a home for her excellent skill set. Jessica is a genuine and down to earth woman who is quiet, yet intently moves through Freedom Massage. You can feel Jessica was meant to do massage with each stroke. 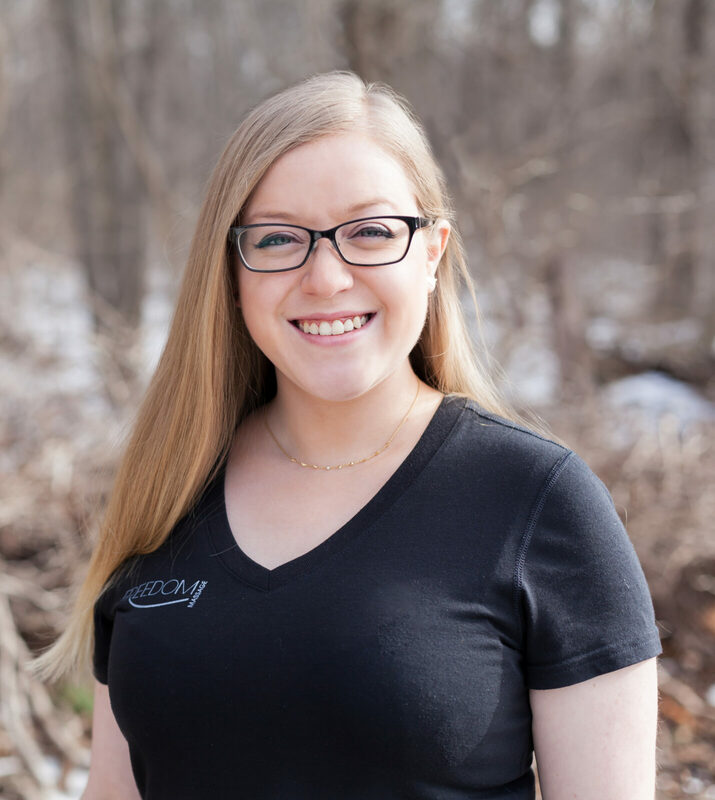 As Jessica says, “Take time to care for your body and your body will take care of you!” Jessica has a solid following, because her massage is awesome! Once you get on the schedule book out, her appointments do not last. Her hours Tuesday 9:45-2:30, Wednesday 9:45-2:30, Thursday 9:45-2:30, Friday 9:45-2:30, and every other Saturday 10-4:30pm. I discovered massage at a transitional time in my life. Prior to massage I was very unaware of my body, not realizing that everything was both physically and emotionally connected. I naively thought my head, arms and legs were separate parts just glued to my torso. Massage has taught me that everything going on in the body is directly related to something else, that it is all linked. Massage has transformed the way I treat myself on a daily basis; it has held me accountable to do my best so I feel my best. I prefer receiving a combination of therapeutic and trigger point massage with a touch of relaxation. I love to feel the instant relief of my muscles letting go of stress and tension. I also look forward to falling into a deep restful state. I like to personalize my massage to each client to fulfill their needs but I also feel that I like to give the same type of massage I like to receive. Over the past five years my self-care routine has progressively grown. I do many things on a daily, weekly and monthly basis to ensure that I am feeling my best. Some examples would be: making sure I get 8 hours of sleep, balanced eating, drinking lots of water, walking, circuit training and yoga 3-4 times a week. I try to receive 1-2 massages every month and I recently started incorporating floating into my monthly routine as well. My next goal is to carve out some time everyday for meditation. When I stick to my self-care routine I feel energized and ready for anything! I instantly wanted to work at Freedom Massage when I saw Diane speak at Cortiva. I saw her passion and drive as a massage therapist and business owner. I wanted a working environment where I could learn, grow and be supported. I wanted to be heard, respected and valued as an employee. Diane takes the time to listen and truly cares. She is a wonderful mentor and boss. From the minute you walk through the door at Freedom Massage you can feel the difference. Your therapist will welcome you with a smile and make you feel instantly comfortable. Clients are handled with care and gratitude. We are a team at Freedom and we want our clients to be fully satisfied with their experience. We encourage clients to try all therapists until they find their perfect match. Diane is always available and welcomes any and all feedback to help make Freedom the best! Kimberly, a graduate of Cortiva Institute and a member in good standing with AMTA, worked practicing massage in Montgomery County upon graduation. After spending two years accomplishing her prerequisites for nursing at PSU-Abington, her calling became clear and directed her towards massage therapy. Kimberly comes from a medical background and has experience treating various ailments and helping alleviate her patients’ suffering. She believes movement of the body is essential for health and longevity, and tenderly tailors it for each of her clients. Kimberly’s positive attitude and smile has been contagious here at Freedom Massage! She performs Swedish Relaxation, Deep Tissue, Prenatal, The Freedom Massage, and is also comfortable working with minors. 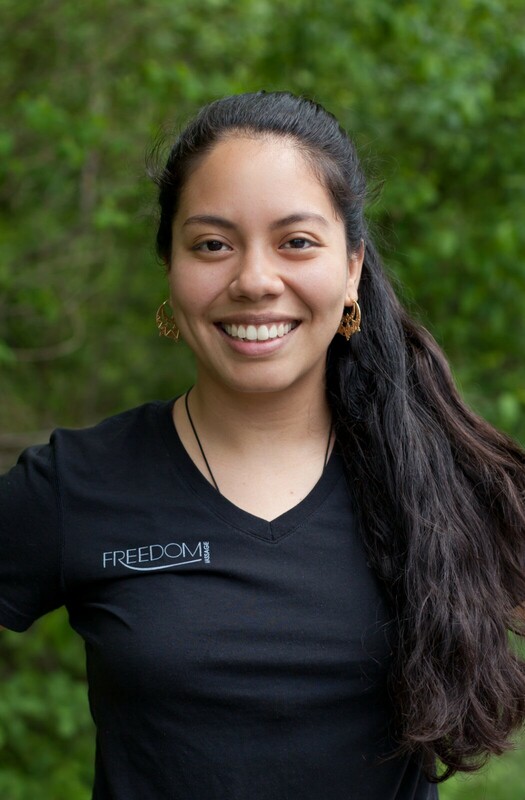 Kimberly feels very lucky to have found her calling in life, and looks forward to growing in her field here with Freedom Massage. Kimberly blended right in to Freedom Massage with her uplifting outlook. You will feel a medical edge in her sessions with a twist of flow on top. We are honored to have her with us. If you want to experience her unique approach call now as her book fills at lightning speed! Her hours are Monday 9:30-2:30, Tuesday 9:30-2:30, Wednesday 9:30-2:30pm, Thursday 3-8:30, Friday 3-8:30, and some Saturdays 10- 4:30pm. Since I discovered massage therapy, I have had a clearer vision of my life purpose. I knew I wanted to be of service to others and massage therapy allows me to do just that! It continues to inspire me daily- to listen to my body and take the right steps of action to feel better. Neuromuscular/Corrective, Myofascial, PNF, Reflexology, Deep Tissue, Swedish are some styles I prefer giving. Two very unique personal experiences have been receiving Thai massage and an ortho-bionomy session. I am open in receiving these modalities and trying out new ones! I like to practice meditation/yoga, running, and hiking. Epsom salt baths are part of my self-care routine too. I chose Freedom Massage because it is a space where growth and being yourself is encouraged. Thanks to Diane and my colleagues, I am feeling more motivated than ever to continue exploring the wonderful craft of manual therapy and the various healing modalities that exist around the world! I believe what sets Freedom Massage apart from other places is that the owner Diane is a massage therapist herself, that it is encouraged for clients to work with all therapists, and that we are a space that is catered solely towards bodywork— no other spa services like facials or hot stone. Freedom Massage is truly a special place! Michelle graduated from Cortiva Institute, and is a member of AMTA. She was voted best in class by teachers and peers. Michelle has great compassion and understanding. She will put you in a state of relaxation helping your body to heal itself. Her skilled usage of forearms and elbows allow her to attend to clients who request Deep tissue bodywork. Michelle’s free spirit, passion to grow, and to please others shines through in her bodywork. 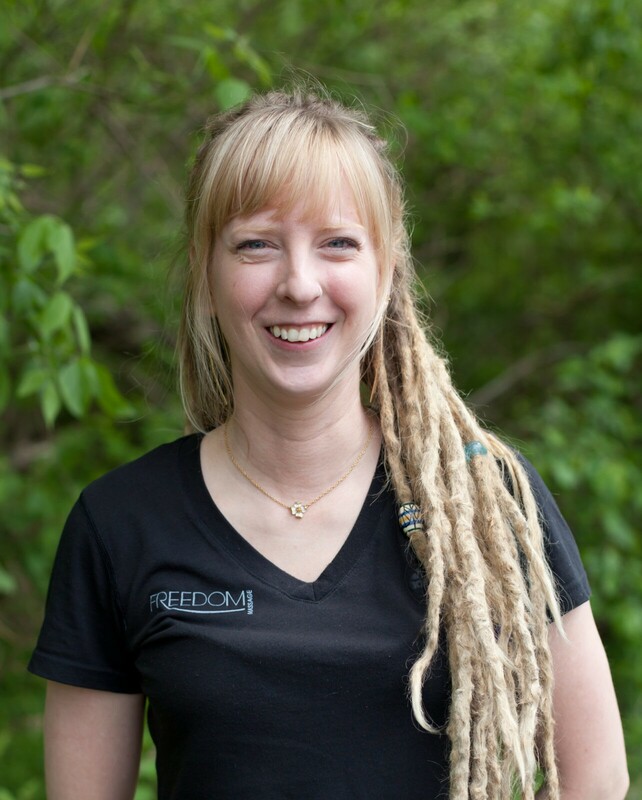 Her giggle and smile are contagious and they will leave you feeling right at home here at Freedom Massage. She completed a Thai Yoga bodywork class with the Vedic Conservatory in Feb 2016 and does do some work on the table. Michelle provides . Swedish, Deep tissue, the Freedom massage, and Pregnancy sessions. Michelle knew she would work at Freedom Massage before she even graduated school. Now here, she has become a powerful creator attracting a solid book of massage. She has followed closely in the owners footsteps with her bodywork. Don’t let her size fool you– she is strong. 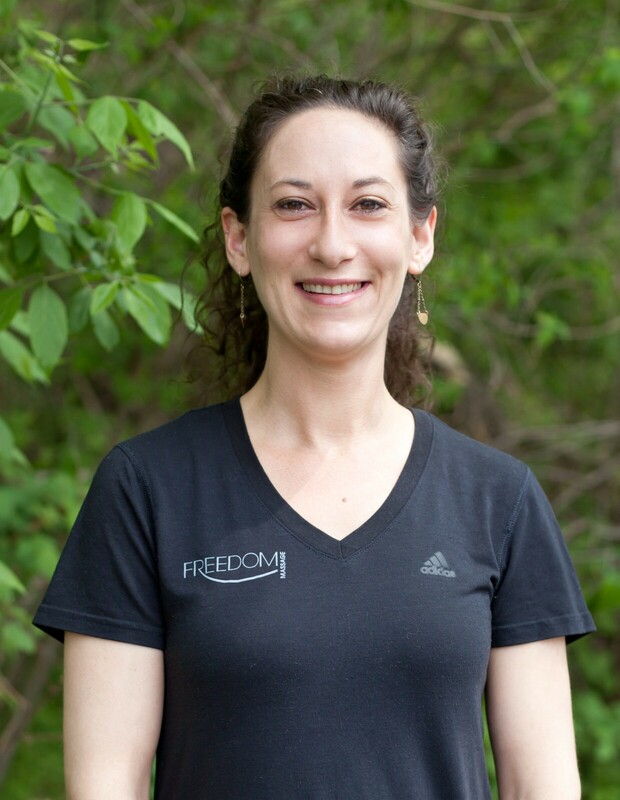 Michelle is hard working and truly dedicated to Freedom Massage we are honored to have her with us. Get on her schedule her appointments fill quickly and stays filled. Book out! I have always been in some field of customer service and my free spirit has drawn people to me. Massage has allowed me to continue my life journey to touch people’s lives and build positive relationships with them. It is a gift to give someone a moment of happiness. Be it a warm smile or a kind word, I strive to be the light in a person’s day. Massage has helped me to step up my game in positively affecting someone’s life. I now have a platform to offer a client a safe space where they can let their guard down and begin to relax. Our daily lives can be beyond busy and we often lose sight of being in the present. Massage therapy has shifted my life towards an attitude of gratitude. My days can be filled to the brim and my mind goes a mile a minute at times, but what a great relief I get when I step into my massage space and it all disappears. For that period in time I am forced to put down the technology, focus on being present and providing a care that fills my being with joy because I am giving of myself. I love to experience all types of massage. Massage for me is an incredible learning tool. Every single time I get a massage I learn something…be it good or bad. This has helped me tremendously in my career. It continues to keep my personal bar/goals high in the care that I give to clients. Through receiving massage I have learned to love and accept my body the way God has designed it. The most important area for self-care is to accept and fully embrace my free spirited nature. My life has changed dramatically over the last 7 years. I went from living in Alaska to now owning a home and being a newly married “bonus mom”. It is important to be aware of your journey through life and pay attention to how your body and mind reacts along the way. At this point in my life the term “self-care” means to know what is it to get routine massage, stretch and use my body, be well educated in areas of my life that will affect my future and to be gentle with myself. Self-care to me means to have grace and humility. Not be overly harsh on my mind, body and spirit. To know that I was created from a higher love and put on the earth to spread love. Self-care means to give of myself and take care of others all while having healthy boundaries. Always do your best in every situation, but to remember that “your best” will be different for each of those situations. Freedom Massage is not cookie cutter by any means. Throughout my entire working life I have always sought out small business’s to be a part of and take great pride in the places I have worked. The past few years working at Freedom Massage has heavily impacted my life. Daily I am surrounded by a group of women who care, support and encourage beyond their means. I am constantly lifted up and appreciated by an amazing boss who has come along side to be a mentor, not just with massage but in life as well. So many places in the work world today discount their employees as easily replaceable. At Freedom I know I have been carefully hand selected by a woman who has been in the field for over 20years and who has put her faith in me to deliver the best care I can for clients. It all comes back to my pride. I take great pride in the places I work and have worked. I take great pride in always doing my best and pleasing my employer. Freedom Massage has an amazing, well earned reputation and I wanted to be a part of it. I believe Freedom is different based on the extensive training each therapist receives when they are brought on board. Each therapist already joins the team with a passion, intuition and a great compassion for people in the world. We all want to give our best every day we are there and Diane continues to lift us all up to reach the bar that is set high. The owner Diane comes alongside each therapist and spends hours of ongoing training to teach us the true basics of body work. We learn what it means to listen to our clients, let go of perceptions, have healthy boundaries and that each individual has a story. It is not our job to “heal” people but to be there when they choose to do so on their own. No two bodies are the same, therefore no two sessions are the same. We offer full 60 minutes of hands-on bodywork, which does not include intake or checkout time. We take our time, never any rush with any client. If we don’t have an answer we will get you one, or find someone who can help. Diane is a wealth of knowledge and has so many connections that few other places can offer. We have very high standards. Molly was inspired by the healing and comforting effects of massage. She is a graduate of Cortiva Institute. Molly went from a career as a cosmetologist to a fulfilling life as a licensed massage therapist. She has a background in both Swedish and Deep tissue work with a style that is relaxing and restorative. She will provide you with power and grace. Molly provides Swedish massage, Deep tissue, Pregnancy Massage, and the Freedom massage. She is also a certified Oncology Massage Practitioner (Certification course approved by Society for Oncology Massage S4OM.org) Since joining the team she has been getting rave reviews and is a great resource in our community outreach events. Molly met Diane at the Cortiva Institute and knew Freedom Massage was the place she wanted to work. She is powerful, smart, and has a wonderful sense of humor. Her massage has taken quantum leaps at Freedom Massage. She is a solid member, and her book is filling quickly— get in with her now! Molly is strong, but will also put you in a trance. We are all amazed by how Molly continues growing into an even more solid massage therapist. Book as many appointments as you can while you are here, they will not last. Her hours are Monday 2:30-8:30, Tuesday 3-8:30, Wednesday 3-8:30, Thursday 9:30-2:30pm, Friday 9:30-2:30pm, and occasional Saturdays. Massage has truly opened up a new avenue of life for me. Prior to finding massage I was stuck in a rut of a career, with no real future or potential to expand, and it soon became monotonous and frustrating. Massage was something I always had in the back of my head, always a yearning to learn. One day I just took it upon myself to check out the closest and most well-known massage school near me which happened to be Cortiva. That day after the tour I enrolled myself on the spot; it didn’t take much thought and it was the most freeing and most sudden life decision I’ve ever made, one that changed my life for the better. Once in school I got more into yoga, understanding the body, stretching and eating better. It was like a light finally went off and I felt for the first time I had a real purpose and was beyond excited to put everything into action. Since then I enjoy life so much more both through work and on a personal level. The style of massage I like to give varies day by day: I am always open and willing to roll with any modality and pressure range the client is feeling, although my favorite is always The Freedom Massage — this also goes for receiving! There’s something about addressing problem areas with both deep and relaxing work. Sometimes the body, I feel, can only take so much and needs a little TLC as well, so good solid pressure and a relaxing vibe always makes my day. When it comes to personal care there’s nothing better than just taking a deep breath and allowing yourself to do nothing! Yes, of course I get my stretching, massage and workouts in throughout my busy weeks, but my favorite thing is to let my brain and body chill out by sitting outside in the mornings on my porch with a cup of coffee, just doing nothing and taking in the day. You’d be surprised I’m sure that my self-care is so simple, but my brain always seems to be going constantly and this little morning meditation time by myself, sometimes with my cat, is a really great kick start to my days. While in school at Cortiva Institute for massage my very first teacher there was so excited to share with us that we had a special guest coming in to speak. After asking more about it I found out that the speaker was going to be Diane, the owner of Freedom Massage (and now my boss!). The way my teacher spoke about her I was enthralled, I knew this was someone I had to work for. The day of the talk I made sure I had my resume’ prepared and listened intently to everything Diane had to say. It was with a shaky hand and big smile I introduced myself and passed over my resume’ even prior to graduation. After that point any time Diane came in or spoke at Cortiva I made my presence known until my graduation and passing of state boards. I was finally given the opportunity to work for my first and only choice and I am beyond fortunate to be at such an awesome place surrounded by other like-minded and driven women. Freedom Massage is something truly unique. I say “something” because it’s not just a place, it’s so much more. Freedom Massage is a family of well-educated, determined and loving therapists, all with their own style and views, yet who still mesh beautifully. It’s somewhere you can come as a client for the first time and be treated like you’ve been coming for years. I believe we proudly distinguish ourselves not only by the talent of the owner and therapists, but by the friendly and open nature of the studio. Equal parts professional and comforting, I haven’t been to any other place with the warmth that comes from here. Sarah graduated from Cortiva Institute, and is a member of AMTA. After a decade of working retail, Sarah decided she needed a career that felt more meaningful, something to bring her back to her early roots as a dancer. Through practicing the art of bodywork, Sarah has found a renewed connection to her love of bodies, movement, the mind, and how these work together. Sarah can provide Swedish massage, Deep tissue, and Pregnancy sessions. She is also comfortable working with minors, and loves to help clients (especially those new to massage!) feel understood, comfortable, and prepared for receiving a great bodywork session. She is so happy she found Freedom right away upon graduation, and is honored and proud to call “The Freedom Family” her own. She is a joy to be around, clients love her, and she has created steady following at Freedom Massage. She is thoughtful, accommodating, and extremely talented. Sarah has a heart of gold and we are honored she is with us. Book out your appointments if you can find one. Her hours are Monday 2:30-8:30, Wednesday 3-8:30, Thursday 3-8:30pm, every other Friday 9:30-2:30, and usually every other Saturday 10- 4:30pm. Becoming a massage therapist has given me work I love! This career has also allowed me to express my care-giving nature, helped me slow down and notice my own body’s needs, strengthened my awareness of the mind/body connection, and provided a more healthy work/life balance. What style of massage do you prefer to give and receive? I enjoy working on some areas of focus while also giving the rest of the body care, to bring a connection throughout the body. This is usually the type of work I want to receive as well. I also love the subtlety of myofascial work, the feeling of deeper releases with an initially less deep pressure/touch. It is important to me, both for clients AND my own body, to acknowledge that we are different each time we come to the table and to allow ourselves a shifting nature to what we need each session. I really enjoy prenatal sessions as well! DEFINITELY regular massage!! I try for at least once a month. In all honesty, self-care is something I often struggle with, so a lot of my self-care routine involves trying to slow down, drink enough water, get exercise, and remind myself to love myself as much as I love others. I received my first massage ever at Freedom Massage a decade before I knew I’d go to massage school. I didn’t want to work in a chain location, wanted something more local and small business oriented, and knew of Diane/Freedom through the community and school. It wasn’t really an option in my mind to work elsewhere, so I’m glad I was able to find a home here at Freedom! So many things! We are a tight-knit, drama free group that supports each other! Our owner, Diane, has been a practicing massage therapist for over 20 years, so we get constant mentoring from her which is invaluable. I feel we are given the time and ability to show each client individual attention, adjusting sessions to their particular needs, rather than placing them in a cookie cutter mold. We are given the ability to be involved with ideas and the day-to day function of the business, and I think this allows each one of us to be invested, responsible, and proud of the work we do! 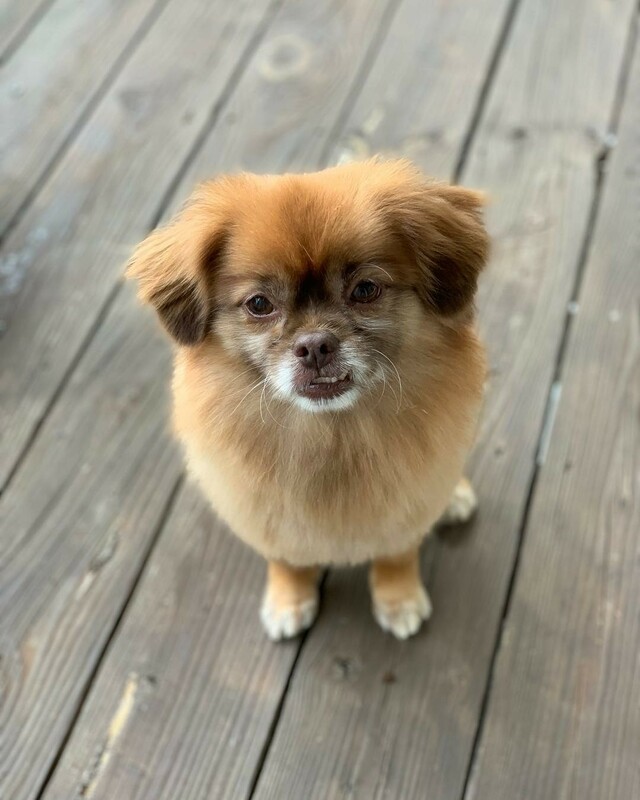 Ginger was rescued by our Owner. She is sometimes available “by request” to greet clients in the Lobby. She does not go to the “massage area” of the building. If you want to see a little dog who will be very excited to see you ask staff if Ginger is in for the day. Ginger is full of energy, loves to be snuggled, is happy to see every human, and would love to be pet by you. Ginger stays pretty busy, if she is not available when you are here, she sends her love. Interested in joining a team of award winning therapists?